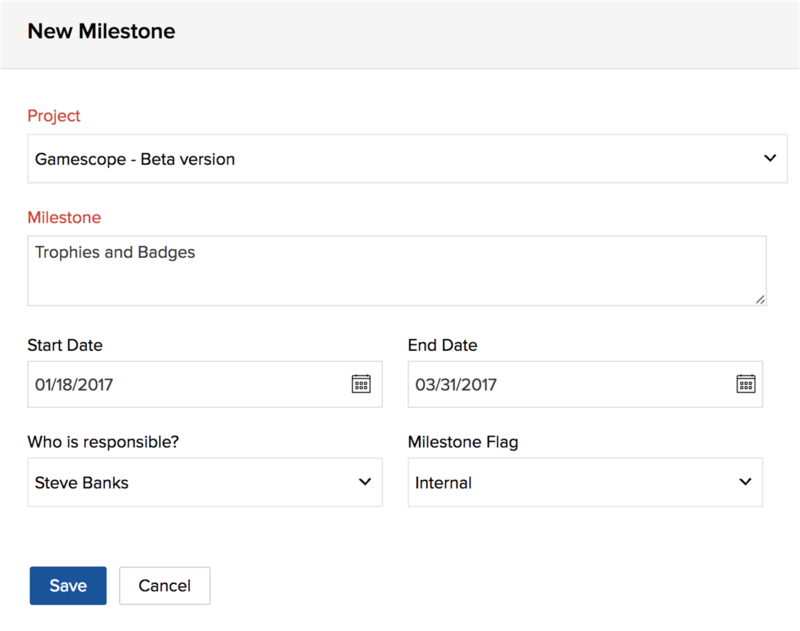 The My Milestones view provides a consolidated list of all your milestones in various statuses and allows you to access the associated task lists, tasks and bugs. The milestones are classified into Active Milestones,Archive Milestones and Completed Milestones. You can view both the tasks and the bugs associated with milestones right within My Milestones. In Home, navigate to theMy Milestones widget to view the milestone list for all the projects. Click View More in the upper right to get the complete list of the milestones assigned to you. ​You can now group the milestones based on Project or Status. You can also export the milestones as a PDF file. Click to filter the milestones based on their Owner or Status and click to export them to a PDF file. Click New Milestone to add a new milestone and assign it to any project. Select a Project to map the yet-to-be created milestone. Give a name for your Milestone. Decide Who Is Responsible for the milestone. Set the Milestone Flag. If the flag is Internal, the milestone will not be accessible to the client users. If it is External, it can be accessed by the client users. Hover over a specific milestone. Click to Edit, Complete, Delete orviewthe Release Notes accordingly. 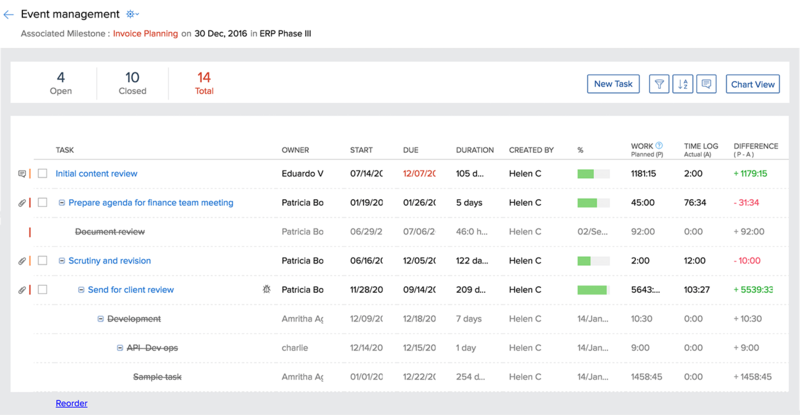 To sort the results based on Milestone, Owner, Start Date, Due Date, and Type , click in the upper right corner of every section. Click a milestone from the widget directly or click View More in the upper right to access the other milestones. Edit, delete, move, complete or follow a milestone here. Hover over the milestone name; click and select Edit. Navigate to the Move Milestone section. 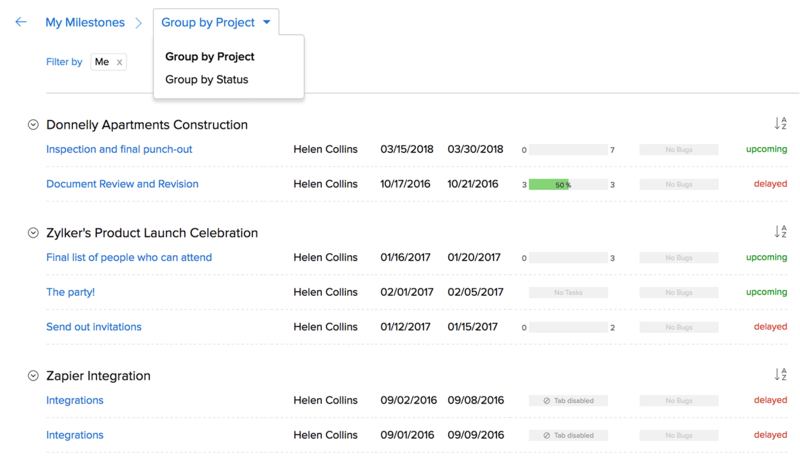 Select a different project to move the milestone. When you move a milestone, all its task list dependencies will be lost. Task lists for any selected milestone can be viewed right within the Milestonesdetails page. You can add a new task list, move a task list to another project or delete task lists. In addition you can click on a task list to view its tasks. Alternatively, you can also view the bugs associated with the milestone. Click a milestone to view its details. Click New TaskList to add a new task list. Give a TaskList Name. Here, you can create a new task list or associate an existing task list or choose from the list of templates. Click a milestone to view its details. 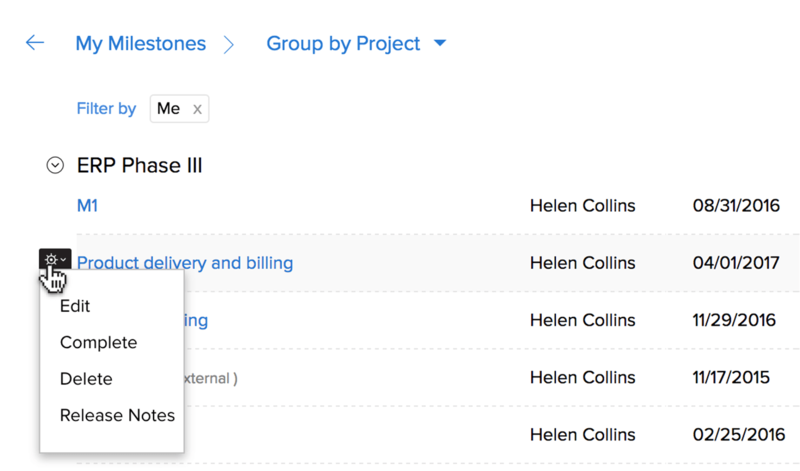 Here, you can move a task list from one project to another and also associate a new milestone to the task list. Select a task list to enable the Delete and Move options. You can move or delete a single task list or multiple task lists. To move, Select a Project and Choose a Milestone. In My Milestones, click a milestone and navigate to the Bugs section to view the consolidated list of bugs associated with the selected milestone. Click Add Bug to submit a new bug. You can edit an existing bug too. Hover over a task list name. Click and then select an action. You can Edit, Delete, Complete, Follow and Print the task list. A warning message is triggered when you complete a task list with open tasks. In My Milestones, click a milestone to view its task list(s) and click the task list to view its tasks respectively. You can see all the tasks associated to the selected milestone in the Task Listdetails page. 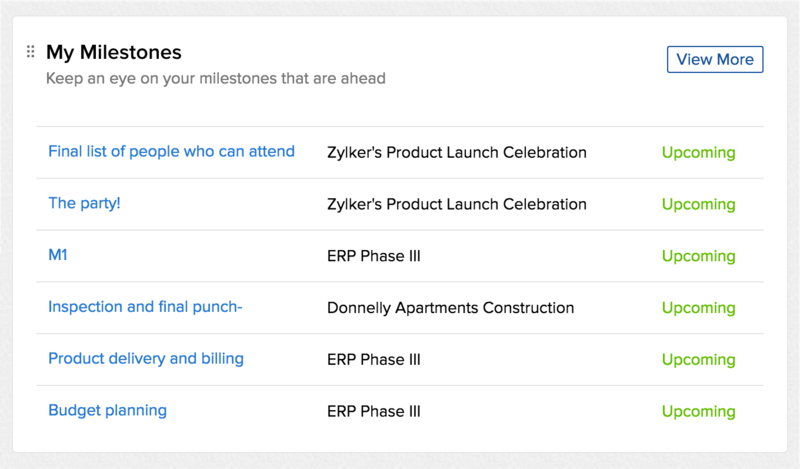 To add a new task from the My Milestones view, click a specific milestone and land on its task list details page. Give a Task Name; Add Description; decide Who Is Responsible; set the Start Date, End Date and the Priority. 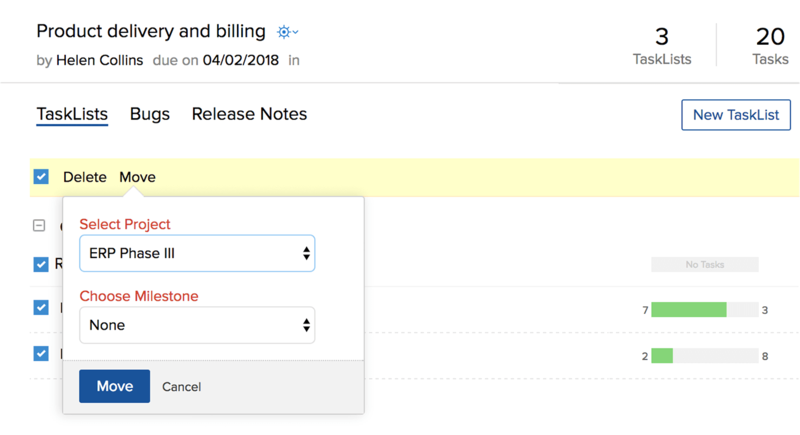 You can also create tasks without setting their End Dates, by specifying only the task duration. You can also click open a task and edit it when needed. Click to filter the tasks based on different criteria and click to sort them under various categories.